Cat Water Fountains – Do They Keep Water Cold? Cat water fountains advertise that they keep water cold so pets will drink more. We tested several cat water fountains to see if these claims are true or just hype. The advantages of drinking cold water are commonly known, so it is no surprise that claims are made even if they are not true. We checked the temperature of 3 quarts of 72-degree Fahrenheit water in bowls made of common materials: plastic, low-fire imported ceramic, stainless steel and glass. We also tested three cat water fountains including a plastic fountain with a UV light, a plastic fountain with a large dome and spillway, and the Glacier Point Perfect Pet Fountain, an American-made non-porous ceramic fountain with a thermoelectric chiller. The room temperature during the test varied from 72 to 80 degrees Fahrenheit. After 30 hours, the temperature in all four bowls was basically unchanged. The stainless steel bowl was 1 degree cooler (71 degrees). The glass bowl was unchanged (72 degrees). The plastic and low-fired ceramic bowls both increased by one degree (73 degrees). The water in the three cat water fountains varied by as much as 28%. The fountain with the UV light increased by 4 degrees (76 degrees). The plastic spillway fountain decreased by 5 degrees (67 degrees). The Glacier Point Perfect Pet Fountain with the thermoelectric chiller was 59 degrees Fahrenheit … 13 degrees cooler than the original water temperature and 17 degrees colder than the UV light fountain. Why Are Cat Water Fountains Cooler Than Water Bowls? Various factors cause water to increase or decrease in temperature. Static water in a bowl will stay the same temperature as the surrounding air regardless of the bowl material. 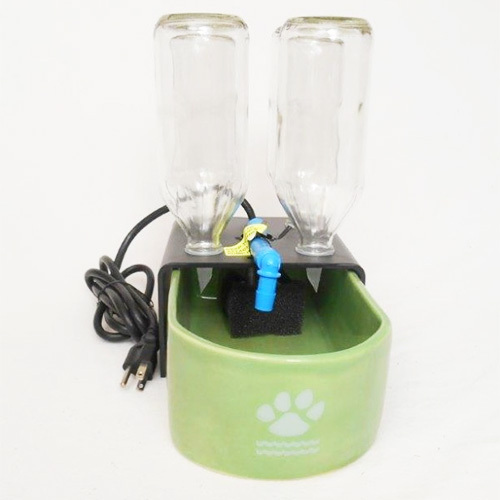 A circulating cat water fountain will decrease slightly due to greater exposure to air, using evaporative cooling to lower the temperature of the remaining water, but the amount of cooling will vary depending on factors including heat generated by the pump itself. The thermoelectric chiller used in the Glacier Point Perfect Pet Fountain uses the “Peltier effect” (http://www.novatecproducts.com/about_thermoelectric_technology.htm) to absorb heat through its probe and transfer it to the atmosphere through fins with the help of a quiet, low-speed fan, its only moving part. Since no compressor is needed for cooling, the chiller is extremely reliable. It requires no refrigerant, so it’s environmentally friendly. It can chill the water from room temperature to 60 degrees in only a few hours and will maintain that temperature consistently 24/7. Why is water temperature important? Common sense and empirical evidence have shown that cats drink more water if the water is cold than if it is room temperature. All vets recommend that cats be provided with plenty of fresh, clean water to prevent and treat kidney disease which is a leading cause of premature death for cats. Most cat water fountains will cool the water slightly, but only the Glacier Point Perfect Pet Fountain will chill the water substantially to the naturally cold, pure temperature of a mountain stream. What are your thoughts on this subject? Does your cat prefer cold water? Does he/she prefer to drink (or insist on drinking) from kitchen or bathroom water faucets?